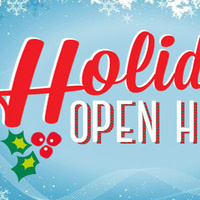 Get in the holiday mood at the Cross Lanes Library's Annual Holiday Open House. Several activities are planned, including music by Andrew Jackson Middle School Choirs, and making holiday crafts. A very special guest will arrive at 7:30 p.m., so bring your camera. Cookies and punch provided by the Cross Lanes Library Board and the Women's Club of Cross Lanes. Doors will open at 6:30. All Ages.